Given by Mrs Mary H. Greg. 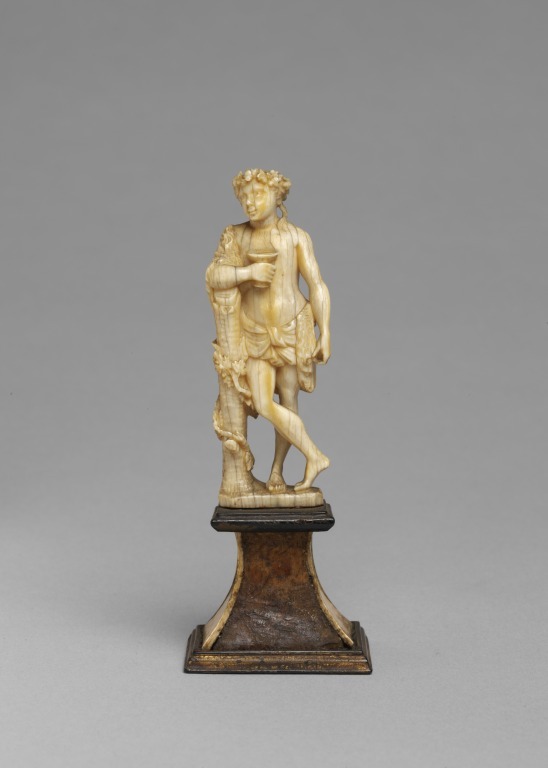 This figure and A.2-1978, representing Summer, were once probably part of a set of four figures symbolising the four seasons. Such small-scale statuettes were popular as decorative items. Ivory carving flourished in Dieppe in the late eighteenth and nineteenth centuries. 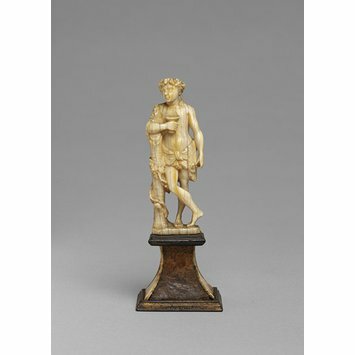 This male allegorical figure of Autumn is shown in the guise of Bacchus, wearing a panther skin and loin cloth, holding a goblet, his right leg crossed over his left, recalling classical imagery, leaning on a tree trunk wreathed in grape-laden vines. Given by Mrs Mary H. Greg, 27 St Mary Abbots Court, High Street Kensington, London, in 1928. Mrs Gregg gave a large number of objects to the Museum during the 1920s and 1930s, including dolls and toys for the Bethnal Green Museum (now the Museum of Childhood), and textiles.